Home Of Maine’s #1 Lobster Roll!! Nestled at the foot of Wiscasset’s Main Street for decades. Our Opening day will be April 15, 2019!! Red’s Eats is awarded TripAdvisor’s Hall Of Fame!! 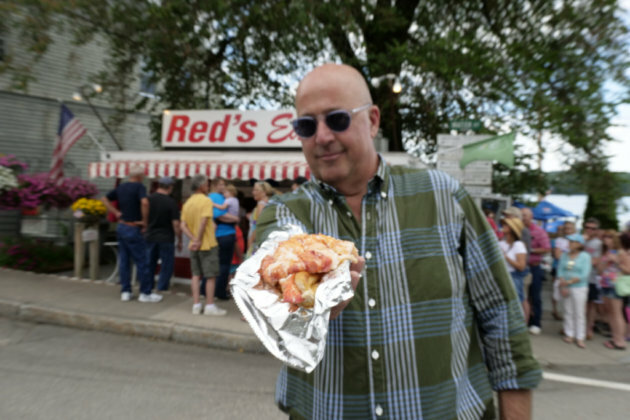 Andrew Zimmern…The Zimmern List *Travel Channel * Eating Live With Sly* Food Network * CBS Sunday Morning * Phantom Gourmet * USA Today * Coastal Living Magazine * 2017 Road Food Champions * 2017 Maine’s #1 Lobster Roll Readers’ Choice ~ Down East Magazine * The Most Iconic Restaurant In Every Single U.S. State *Blackstone Valley HOGS 17 Years in a row * 2017 Jaguar Lobster Run * Huffington Post * Trip Advisor Certificate of Excellence * Allagash Brewing Co. * 20 All Time Best Seafood Dives ~ Steve Millburg Coastal Living * Best Things Maine * Suzi Thayer ~ Gagnon Family Story * Brick House 319 * Find.Eat.Drink. * America’s Most Honored Business Award * Thanks to ALL of you!! We are just thrilled….truly honored!! And Thank You to all of our guests…We appreciate you and your visits to Red’s Eats!